This offer includes a number of trading tools and features aimed at making your trading life easier. As part of this limited offer, you’ve successfully for the free $50 no deposit bonus that can be used with easyTrade or dealCancellation within our trading platform. Please note, this bonus will only be made available to Australian residents. Imagine having the ability to place a trade with our innovative award winning platform using a free bonus and being able to keep any profits you make. Register and get access to our latest risk protection trading tools, easyTrade, dealCancellation and our all our platform features. 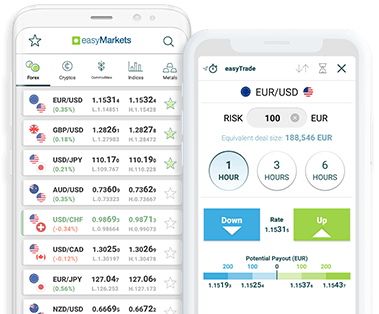 easyTrade allows you to trade without margin, unlike other trading platforms that require you to maintain a percentage of funds in your account. dealCancellation allows you to place a trade, and for a marginal fee, be permitted to cancel it within the first hour it if it’s looking unprofitable … as if nothing ever happened. These tools are every trader’s dream, but now they’re real and true. Register now (it’s free) and comes with a $50 no deposit bonus. Register now to secure this offer. You can start trading right away, check out the features and even paper trade in a fully featured demonstration environment. It costs nothing to register, and access is instant just a click away. Trade with limited risk, unlimited reward potential, no minimum margin, no spreads, no commission, no automatic stopouts. Absolutely the easiest, yet most advanced way to trade. easyMarkets allows you to cancel a losing trade within the first hour for a small fee. Think of it as insurance supporting your trade that can protect you to avoid potentially thousands of dollars of losses. Try our flagship tools, easyTrade and dealCancellation risk free with a free $50 trading bonus. Plus, you get to keep any profits in a profitable trade. With this offer, there is no reason to fear trading using our platform.Trade using our web platform or anywhere using our Android and iOS mobile apps. A Stop Loss is a pre-set price where you want to exit your trade. Problem is, most of the time a broker just puts your trade on the market and you hope for the best. There’s no guarantee you’ll get out at your chosen price. easyMarkets guarantee you will exit at your chosen price. And unlike the handful of other brokers also doing this, we don’t charge a cent for it. It’s FREE. Freeze Rate is FREE and protects you against fast moving market movements when placing your trade. Anything can happen in these few seconds and Freeze Rate makes a significant difference in your opening position in volatile markets such as forex or cryptocurrencies. Some trades can be risky with the potential to put your account into negative territory. easyMarkets guarantee that no matter how you set your trade up, a sudden market move will never cause your account to go negative. This extra protection is unique to easyMarkets. Have you ever entered a trade at a different price to the one you saw? If you have then you’ll love easyMarkets Zero Slippage, guaranteeing the price you see, is the price you trade on. You can use it with easyMarkets “Freeze Rate” to hold the price for longer and enter the trade exactly as you intended. Most brokers may promise low spreads however their spreads fluctuate with market volatility. With easyMarkets you will know exactly what the exit spread will be when you trade, making it easy to make decisions. Better still our spreads are among the lowest in the market. You aren’t alone with easyMarkets. Every day you will get 2 high probability trades from our expert technical analysts. You will know where to enter, where to take profit and where to set your stop loss. And you get daily market updates sent straight to your inbox keeping you ahead of the market. Plus, you can join our online community and discuss trades and chat with experienced traders at any time. While you find your trading feet, we will hold your hand and cover your first trades risk free up to the value of your dealCancellation* bonus, so you can avoid losing money if the trade has a negative outcome. Plus, you get to keep the profits in a profitable trade. With this assurance, there is no reason to fear placing your first trade. Think of it as an insurance policy whilst trading, exclusive only to easyMarkets. Get your limited time $50 bonus to try our trading platform risk free. Register now to secure your easyTrade* and dealCancellation** bonus. This extended offer is limited and will be closing soon. Don't miss out! easyMarkets has been delivering unparalleled innovation in trading since 2001. ** dealCancellation, when activated, allows you to cancel an open trade within the first hour without incurring any losses. A dealCancellation value of $50 would cover you for approximately 0.5 standard lots (AUD $50,000 exposure) during normal trading conditions. In volatile market conditions the premium increases, so a $50 amount would cover a marginally smaller exposure. This offer is only valid for and available to Australian residents. Do you have a demo platform to access? Absolutely! The demo platform is built into your access and is immediately available to you. You can trade with virtual currency to trial all the platform features including dealCancellation. How long is this Ultimate Trading Toolkit offer valid for? This offer is valid for 30 days. As long as you register for this deal, you can access the demo platform to trial the features. When I'm ready, how easy is it to start trading? Once you register for this offer, account activation is just a one click process. You can even start trading without having to go through a verification process. Trading in minutes sounds too good to be true, can I really start trading in minutes? Yes, this is true. We're the only broker in Australia who offers instant account activation with the ability to trade immediately. Upgrade Your Bonus Protection To Double Your dealCancellation Bonus! CONGRATULATIONS: You're eligible to double your dealCancellation* bonus offer by following the instructions you will see when you click on the button below. This is a one time bonus double offer, so take advantage of it now, if you're ready. * dealCancellation, when activated, allows you to cancel an open trade within the first hour without incurring any losses. A dealCancellation value of $50 would cover you for approximately 0.5 standard lots (AUD $50,000 exposure) during normal trading conditions. In volatile market conditions the premium increases, so a $50 amount would cover a marginally smaller exposure. Click on the 'Activate This Offer' button to activate the offer you're selecting. Upon clicking, you will be directed to a page and prompted to create your account password. Once this is done, your account creation will be completed. You will then be directed to the trading platform to continue with step 2 below. When you enter the trading platform, a window will be presented where you should complete your personal / profile detail. Enter all the fields to ensure your complete profile is added and saved. Once you’ve completed and saved your profile details you can fund your account using any of the valid funding methods available. Your dealCancellation bonus amount will be added to your account shortly, for you to use during your trading. Please note: To be eligible for your bonus double, please complete these entire 3 steps above on your own, and feel free to call us for additional help after they’re complete. Should you call us before steps 1, 2 and 3 are complete, you may no longer be eligible for the bonus double.